It’s certainly a frustration to Tech enthusiasts how Apple enjoys simplifying the spec sheets for their consumer devices. Some of us would like a little more detail as to the exact hardware under the hood of the latest iPad. Although they have told us that it has 9 times faster graphics and a dual-core A5 CPU, beyond that we know very little. Thankfully through a culmination of software benchmarks and physical hardware tear downs, tech gurus have finally unearthed the full specs of the iPad 2. We now know that the CPU is a dual-core ARM Cortex A9 as predicted and its running at a clock speed of 900MHz, which will will automatically decrease to preserve battery life. Anandtech has announced that the GPU inside is the PowerVR SGX543MP2, which is a much beefier dual-core edition of the one found in the iPad 1st gen and the iPhone 4. This new PowerVR chip is 3-5 times faster in geometry tests. 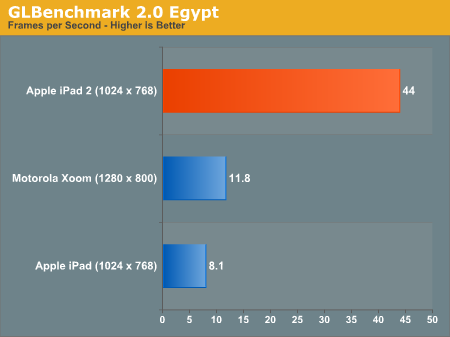 They also conducted a GLBenchmark test finding that the iPad 2 was over 5 times faster than the iPad 1 and nearly 4 times faster than the Motorola Xoom. Although overall benchmarks were not able to reach the coveted 9 times speed increase boasted by Apple when compared to the iPad 1. Thanks to iFixit.com for the tear down of the iPad 2. Theres nothing Social about Social Networking. Wow. I know I had doubts about the iPad, but i had no idea the specs were that good even. I am reconsidering my decision to wait for the iPad 3. or excited that it will have to top that. There everybody, the iPad kills all. Except the OS. It really needs to be better. With speed like that, it could potentially allow a better OS than iOS 4. The iPad now has power, but its still using the software you would find on a iPod touch. To words: “Battery Life”. With all this processing speed under the hood, how long is the actual battery life of the iPad2?